Looking for a pick-me-up? These Cheese and Fruit Kabobs are perfect party food—even on a weeknight! 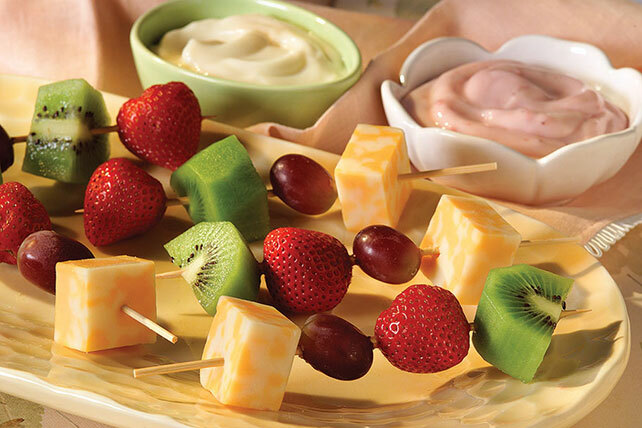 Try these Cheese and Fruit Kabobs as a quick snack. Arrange 1 each cheese cube, grape, strawberry and kiwi chunk on each of 16 small straws or wooden skewers. Serve as dippers with the pudding and yogurt. Let the kids assemble their own kabobs!